This is an action packed horror movie. A terrorist is determined to expose the government’s secret biological war program. Nothing can stop him from achieving his goal. When he cannot expose the government’s secret program any other way, a man turns himself into a terrorist. He bombs a Federal building. He uses the blast to release toxic gas that contains a deadly virus into the building’s air system. This virus is purposely designed to affect humans. It makes their bodies churn out large amounts of adrenalin. They turn from normal human beings into killing machines. Now the government must deal with its own creation. 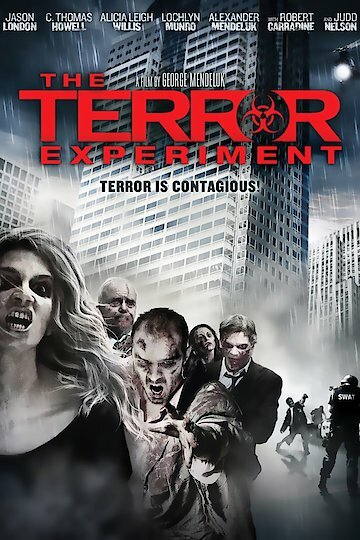 The Terror Experiment is currently available to watch and stream, buy on demand at Amazon, Vudu, Google Play, FandangoNow, iTunes, YouTube VOD online.